Ujjwal Acharya, IFJ’s South Asia co-ordinator reminds us why the IFJ’s annual Killed List is not a macabre roll call from a morgue, but a reminder of why we must ensure that killers of journalists are brought to justice. 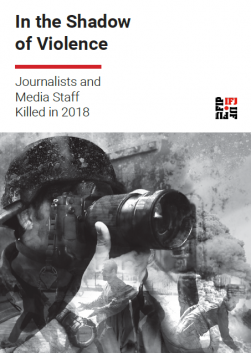 On December 31 every year, the IFJ publishes the Killed List – a list of journalists and media staff killed in the year just past. 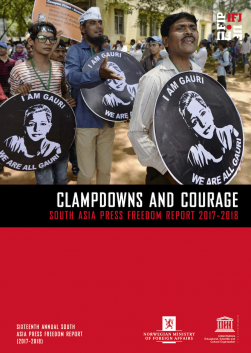 In 2017, we lost 82 journalists and media staff around the world – 23 of them in three countries of South Asia: Afghanistan, India, Pakistan and Bangladesh. But Rasheed’s name is not included in this year’s list, as he was not a journalist in the strict sense of the term, though he had written commentaries on news and events on his blogs since 2013. Rilwan also never made the IFJ Killed List, for he only ‘disappeared’ in August 8, 2014 and there has been no proof to establish that he was killed. The IFJ AP does keep record of missing journalists and media workers on its ‘Without A Trace’ page. This is our space dedicated to the memory of those lost but not forgotten. India witnessed the death of six journalists in 2017. One of them Sudip Datta Bhowmik, a 50-year-old crime reporter, was killed inside the headquarters of the armed police; and another, young Santanu Bhowmik, was beaten to death by a mob because he worked for a television channel that the mob didn’t like. Gauri Lankesh, who was shot to death in Bangalore, was not only a journalist but a woman of many merits, but she was eliminated because some people didn’t like what she wrote. Afghanistan lost a dozen in 2017 – some of them in terror attacks, and some in ambush. Pakistan lost four. Bangladesh saw the killing of Abdul Hakim Shimul, a journalist shot while reporting on a demonstration. The motives behind the killings is mostly to silence criticism, something crucial for a functioning democracy and citizen’s rights. I don’t know all of them, but every time a journalist is killed anywhere, I feel sad. 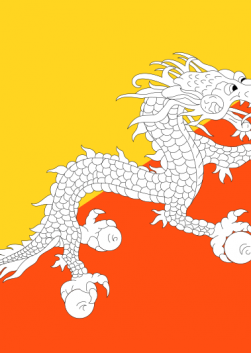 Every time a journalist is killed in South Asia, I grieve because it feels like losing a friend who was just performing the expected duties of a journalist, the same way we all do. We know journalism today is one of the most dangerous professions in the world. For every journalist killed, there are countless incidents of journalists being beaten, attacked, harassed and threatened almost on a daily basis. Most of these journalists in our region work with great passion, on meager pay and in difficult working conditions. After the grief, the feeling turn to anger and frustration because in most of these cases the killers are not arrested or punished. The level of impunity is high, as is the apathy and unaccountability of security agencies and government. Right now we celebrate if police make even a single arrest in any case. Many times, I wonder in despair why I am counting the number of killed journalists. But I know the answer, and that answer is so strong that it gives me strength to continue my work. Because if we stop counting, if we stop monitoring attacks, if we stop raising our voices for justice, and if we stop campaigning for the safety of journalists, then many more journalists will be killed. Passionate journalists and bloggers like Yameen could disappear altogether, and democracy will be on its death bed. So the annual IFJ Killed List is not a morgue register. The numbers are not mere statistics. They are a message of solidarity to journalists all over the world that their work is important, that they will not be forgotten, and there will be attempts to ensure justice to them. Nobody can silence their voices, not even the killers. 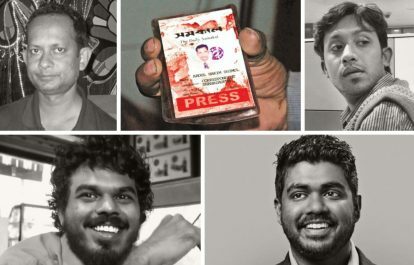 Photo (clockwise): Sudip Dutta Bhowmik, Press ID card of Abdul Hakim Shimul, Santanu Bhowmik, Yameen Rasheed and Ahmed Rilwan.